Receive a professional pedi at home! 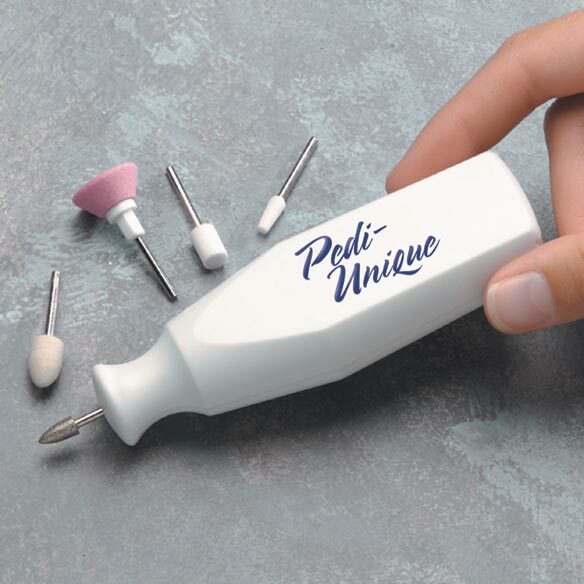 Pedi-Unique™ pedicure tools groom even the thickest toenails and pampers cuticles. Set includes: barrel-shaped emery file, soft felt cone, flat emery disk, cone-shaped file and more. Uses 2 AA batteries, not included. very tough toenails-this is a wonderful solution. I have one toe nail that has thickened across half of the nail. It can get unsightly if not kept thinned down to the level of the rest of the nails. This product is fantastic for that reason. I'm buying my second one because I wore the first one out.....I've had the first one for years. I love the period it help a lot. Small and handy ,needs a pouch to keep up with the small pieces. I have one toe nail which has fungus only to the middle of the nail. This tool is brilliant for keeping the nail from thickening to the point that it is uncomfortable. I'm ordering my second one. To do my own pedicure. need to practice with it more. New style is not always better. I have had a Pedi Unique for 15 years. It is still working but is wearing out. I thought I should replace it with the same brand since I knew it was the best. I was totally shocked by what I received. Over the years something changed. It is now Cheaply made, the tools do not fit snuggly into the hole. It would not shut off. I tried to contact the company to no avail. I am truly sorry that a truly magnificent little machine was ruined. The product spins but when you apply to toes it stops. I think that the describtion of website doesn't match the actual product when it arrives. I wouldn't recommend this product to a friend. It would be a great tool if the tips would stay in long enough to file my nails. Would not waste time on this one.. I was looking forward to getting this as I retired my very old set. When received, I was not pleased. it is very lightweight, and little power, which didn't matter as the various parts just keep falling off. Helps wit limited movement in my hand. Looks to be easy to use and will help me take care of my toe nails. I had one of these before, but lost most of the pieces. I am so happy to be getting a new one. Trouble trimming a disfigured toenail. to make it easier to keep my nails trimmed and pretty. Easier than clippers. My daughter has one and she likes it. spouse has thick toe nails, it works great. I want to file my nails like they do in the nail salon. We need help cutting our toenails. My husband has very hard to cut toenails. I am hoping this will help. I have this style currently but it has gotten corroded. Since I have had this a LONG time and it is in the bathroom, I can't fault the tool. With this new one, I will be smarter and at least take the batteries out when I store it! It works great and I particularly like the pointed end silver attachment - its great for smoothing my nail as it grows out with the acrylic nails I wear. It looks like it might be easier to use, and make it look as though it had been done at a salon. I can't reach to use clippers. I just bought one and I really like the set, so I bought another one for my daughter. for use on toe nails. Since I have become older, it is more difficult to trim my toe nails. I'm hoping this will make it easier. I need a care system for my mother and it looks easy. WHAT DOES GRINDING CONE LOOK LIKE?? BEST ANSWER: The grinding cone is shown attached to the pedicure tool as pictured online. It is silver in color, cone shaped and is made of hard diamond material. Can you order just more tips when they wear down?